“Lightning Strikes” DC Universe Online! For those of you still playing DC Universe Online for the PS3 and PC (or that jumped back on board for the Free to Play Content), the second expansion pack, “Lightning Strikes” is forthcoming and will be focusing on some of our favorite speedsters and adding some new gameplay elements as well. Electricity will be joining Fire, Gadgets, Ice, Mental, Sorcery, Nature and Light Manipulation as the standard powers available. It will be more of a support power than a straight up attack power. The Flash will be Barry Allen and Kid Flash will be Bart Allen. There is no Wally West content in the game at this time. Central City will be added as a new area to explore and although it will be not as expansive as Metropolis and Gotham City, it will feature the Flash Museum! Players will be able to access the Cosmic Treadmill(!) 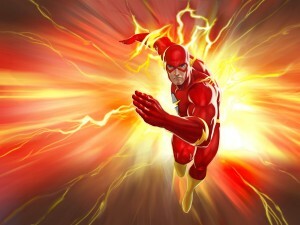 in order to go back in time through the Speed Force and play a part in Barry Allen’s origin. Weather Wizard(! ), Professor Zoom, and Barry Allen are just some of the Flash-related bounties that will be appearing inside of the new Central City map. (Bounties are instances where your character can tackle iconic characters in an effort to bring villains in to answer for their crimes or take heroes out for getting in your way). In the rest of the open world The Trickster (apparently sporting a revamped design), Pied Piper, Abra Kadabra, and the Top (yay for Lia) will be around to menace heroes. And as a final piece of Flash-related content players will be able to acquire Flash’s costume ring as an in-game “trinket” item. Apparently it will grant the user special Speed Force-related powers. All in all a pretty sweet package. The “Lightning Strikes” Expansion Pack retails for $9.99 or 1100 stationcash unless you are a Legendary Subscriber to DC Universe Online and pay the monthly fee. For those customers all additional downloadable content comes free with the membership. Now I was a DC Universe Online customer on the PS3 at launch and for a few months after. I was initially pretty excited with the game but after a short while the lack of content, crazy bugs, chat glitches, etc became too much. Don’t get me wrong, they handled the super speed aspects of the game pretty well. You can use the main power to run up buildings and on top of water and the additional powers allowed you to use a hand spun tornado to pull enemies or push them away from you, vibrate through attacks, trap enemies in a vortex and spin around like a top. They really pulled out the stops. Unfortunately the rest of the game was a chore to play through and all the content pretty much focused only on Batman and Superman (in that order). For someone like me who pretty much only cares about one character, this was an engagement disconnect for me. This new expansion is going a long way towards solving that problem. Still, I’m hesitant to spend money on Flash stuff that does not feature Wally West as it kind of sends the message that I’m o.k. with everything that has occurred. Not only that but I’ve logged on to the game since it became free to play and I’m still not super impressed. It is one of those games that I know I should want to play but for some reason I keep falling asleep every time I do. Seriously I nod off like no one’s business while playing this game. Again this might be an engagement problem as I’m fairly positive that once I start playing the Flash missions, facing off against Weather Wizard (my all time favorite Flash Rogue) and messing around with the new Flash costume pieces I’ll start to get excited again. I guess we will see when that time comes. I do plan on doing a review of the new content when it shows up and if I do end up purchasing it. Are any of you still playing DC Universe Online out there? How many of you plan on picking up this content or checking out the game again since it has become free to play? Drop us a line in the comments below. And once again be sure to check out the full interview here. This entry was posted in Media and tagged Abra Kadabra, Barry Allen, Bart Allen, DC Universe Online, Kid Flash, Lightning Strikes, Pied Piper, Professor Zoom, The Top, Weather Wizard on November 17, 2011 by Devin. Darn it, you actually got my hopes up in the intro that we would see Wally, Jay, and Max. Must be the holidays…sleep deprivation. Funny the first thing I thought when I heard the news was that there would be no chance of Wally being in there. Sad to see that I was correct. I still play this game very regularly. My league and I run all the raids. I’ll be switching my main over to the electric powers. But no Wally West?! Come on guys, that’s so sad. I’m on the PS3 side too. My character’s name is The Jolt if you ever want to hit me up. Nice. I’m The Human Tornado or Kid Whirl. If I see you on I’ll shoot you a comment. Tried DCU Online when it was in Beta. While a very pretty game, and I did like the Super Speed, it felt like a step backwards for much older games like City of Heroes. It is very cool that Flash is getting some spotlight though. Definitely. I played City of Heroes for years and loved it! Despite the pretty graphics and arguably better implementation of super speed this game is just boring and vanilla compared to COH. I really need to save up to get a computer powerful enough to run that game again. I’ve heard it is Free to Play also up to a point. Am I correct? Awwww yeah. If only we could play as one of the villains! I’m not a gamer, but it always bugs me to have to beat up on my favourite characters rather than be able to play them. Still, so glad they’re adding more Rogues and particularly delighted to see the Top get some love. At least the designers promise to do something big with Wally if they get to use him at all. I’m honestly not too upset, since my character “Mr. Friction” is supposed to be a time-displaced version of him. I don’t play games…not since Myst and Riven anyway…but would chance buying a used player if that was the only place Wally ever showed up in action. Well, you know, half the fanbase missed the memo from them that Wally was never worth existing. -_-;; pfft. Nice to see more Rogues & Flash villains added. These guys are *ahem* criminally underrepresented outside of the comics themselves. Another missed opportunity for Wally, though. You can bet that if this game had come out during the Wally West era, Barry would be included in some way. Even if it was Wally in the present and Barry in the time travel mission, he’d be there. All that said, I’m sort of tempted to pick up DCUO now even though I don’t play MMOs. And that is exactly what the problem is. When Wally was active DC would never let us forget that Barry Allen existed. There were reminders everywhere and new stories written featuring him at different points in his career all the time. Now when the running shoe is on the other foot not only is Wally nowhere to be seen but they try to avoid mentioning him at all costs and probably groan every time one of us brings him up. When the new expansion comes out will there be a new level cap, anybody know?